FILE - Taliban political chief Sher Muhammad Abbas Stanikzai, in the first row, second from left, Abdul Salam Hanafi and other Taliban officials pray during the intra-Afghan talks in Moscow, Feb. 6, 2019. FILE - Special Representative for Afghanistan Reconciliation Zalmay Khalilzad speaks on the prospects for peace at the U.S. Institute of Peace in Washington, Feb. 8, 2019. The ongoing U.S. talks with the Taliban have generated hopes for jump-starting an intra-Afghan inclusive peace process to determine the war-shattered country's political future. 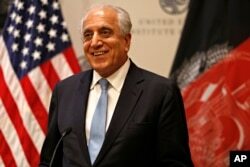 While delivering a public talk in Washington last week, Khalilzad cautioned it was too early to draw any conclusions. "Nothing is agreed until everything has been agreed to. ... The Afghans must sit across the table with each other and come to an agreement about the future of their country," the U.S. envoy emphasized. But Khalilzad acknowledged in his public talk Pakistan's "positive" role, saying the country "has tried to facilitate talks between the Taliban and the U.S. and also favors intra-Afghan dialogue, including between the Taliban and the government [in Kabul]."